Michele is an emerging artist who loves painting our native trees. Michele was born in Wellington, New Zealand in 1960…In 1967 the Family immigrated to Belfast in Northern Ireland where her Father was from, then having lived through the troubles, the Family, Father, Mother and younger Sister moved to Leicestershire, England. Michele has been back home in New Zealand since 2005 working as a pattern maker, but has been a self employed gardener for approximately the last ten years. In her working life, she has the opportunity to study how they grow and form their individual structures. Early last year a photographic workshop in the Waitakere Ranges led to a moment of clarity when Michele was suddenly inspired to start painting again. In that moment she also realized what she wanted to paint and since that she hasn’t stopped. Each new idea inspires another, so here she is today, on a path she believes she was destined to walk. 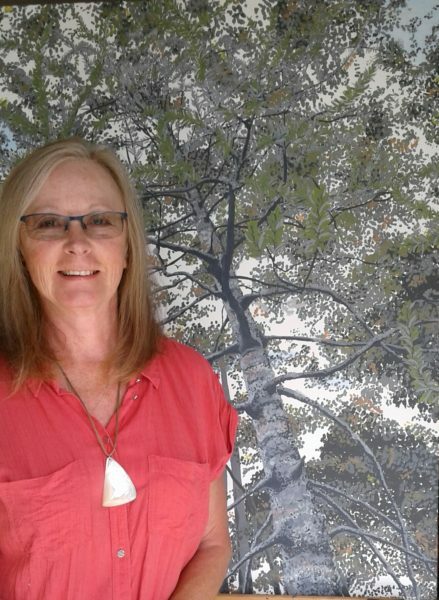 Michele is an emerging artist, she celebrates Kauri and other native trees in all their magnificent glory also aiming to highlight the conservation of Kauri and says..
“We have to protect this majestic tree of which many stories and legends have been told, they are part of us, all peoples! Enjoy and love her work and but don’t get lost in the forest!